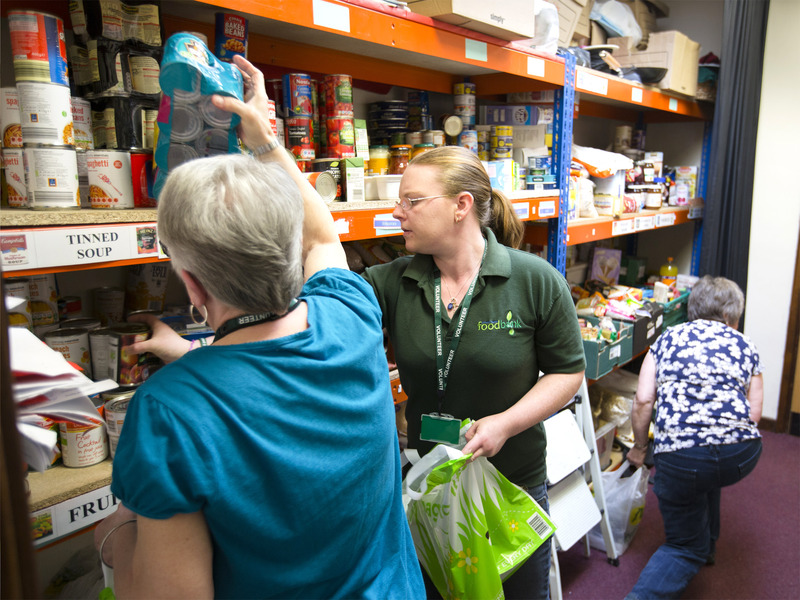 The growth of food banks is a tax on kindness and a measurable indicator of how Britain’s welfare state is being dismantled. 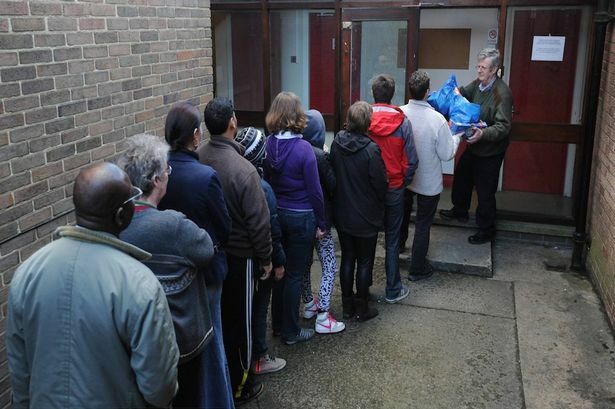 Food banks have become a chronic and shameful indicator of the society Britain is becoming. Five years ago, they were a rarity, but now there are over 1000 servicing families and people that are not earning enough to feed themselves. This isn’t by chance or due to bad economic times. It’s the result of a very well-thought-out and planned application of an ideology that is hell-bent on the dismantling of the welfare state, Thatcherism on steroids. Just as in Victorian times, those who are hungry are the responsibility of citizens to look after, rather than the government, despite many of these people being “working poor” who are paid such low wages that they cannot even afford to feed their families. Often, in this type of situation where money is so tight, it only takes a boiler to break, or a car needing a new exhaust, to force that family into the humiliation of having to turn to charity to get their family fed. The growth of food banks is a phenomenon that is only matched by the growth in the profits of banks and major corporations. It appears both the good times and the bad times are shared by neither party. When you break it down, food banks are funded and supplied by everyday citizens’ charitable donations. Through churches, community groups, etc., channels are created that supply the food needed for the food bank to function. So what we have are citizens paying out their sense of goodness and charity, a cost that should be born by the government, as the money gone to buying the food is money out of that person’s pocket and is a voluntary form of tax on kindness. Maybe the government is well aware of people’s better nature, that when faced with seeing hungry children and families, most people would be more than willing to give some of what they have to help those in need. Often it is those with the least who are the ones willing to give the most.Then on the other hand it’s most likely they don’t even care.Yet this is all part of the privatisation of the welfare state: the very reality of food banks is evidence that citizens, not the state, are lumbered with the responsibility of feeding those too poor to feed themselves. The idea is, we give part of our income in the form of tax to the government, that a portion of it is there for people who fall on hard times, who are sick, or in-between employment. We do this knowing that everyone has a right to basic necessities such as food, healthcare and adequate housing. We also know if some day if we fall on hard times, the same safety net we paid into will be there for ourselves. Now we see, with the bank bailouts and corporate tax breaks, their welfare model is moving toward being only applicable for large businesses, not people. The Tories’ feeble excuse for the rise of food banks is the labour party didn’t direct people to them at the job centrer. So a lack of directions was causing the problem, not poverty. 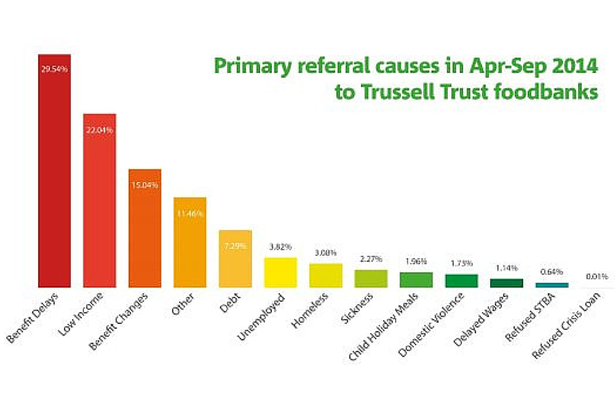 The reason the Tories now graciously point people to the “free food” is that 29% of those needing food banks are people having their benefits cut off. 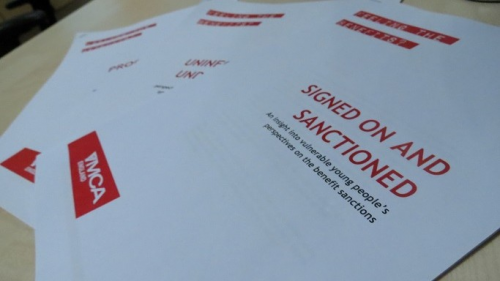 From April 2013 to May 2014, figures released show more than 900,000 people have had their benefits sanctioned (nice word for stopped being paid), often for trivial reasons such as being 10 minutes late to an appointment at the job centre, or a man with heart problems who was on Employment and Support Allowance (ESA) and had a heart attack during a work capability assessment. He was then sanctioned for failing to complete the assessment. These and many more petty and cruel reasons deprive people of all income for the coming 6 months. The mentality the government is gradually feeding into the growing privatisation of social services is “welfare isn’t a right, but a privilege” that you have to earn and prove your worthy of with a series of “built to fail” tests set up for the beneficiary. During that 6 months without any income, the burden of care rests on the community, family and generosity of others. That is for the lucky ones; others just go hungry, are forced into commiting crimes or give up the will to live. There has been a tragic marked increase in suicide directly related to these kinds of measures having been introduced. The meanness of this mindset, in comparison to the generosity of corporate welfare, is both despicable and obscene. George Osborne in his recent budget is slashing £12 billion off benefits, whilst the government annually gives exemption of tax on jet fuel, saving the airline industry 15 billion a year in costs. That is just one of the £93 billion tax credits, subsides and handouts given by the UK government. The largess and generosity toward the business class makes their stinginess and attack on Britain’s poor even more cruel and heartless. This ideology that Tories encapsulate so well is replicated throughout the world. We see it in Australia with the Abbott government. We see it in how Greece has been hijacked and terrorised. We see it in the growing poverty and wealth gap in the U.S. It’s the ideology of “more for us, less for you.” We look after each other, but you have to look after yourself. It’s the privileged class becoming more isolated, ring-fenced in and brutal in how they increase and maintain their wealth. The dismantling of this ideology will take nothing less than a revolution, as its disregard for people is matched only by its disregard for our environment. The environment, unlike people, is pushing back with consequences that will impact us in ways even the privileged class can’t stop with propaganda or violent coercion, which is the normal remedy against that which threatens their power. If there has ever been an epic battle that holds in its outcome the fate of the human race, this is it. As we each draw breath, there is still hope we can rise up and dismantle this monstrosity of a system that is ruining the earth and its people. How it’s done and if it will come to be, I don’t know, but as long as we vigilantly keep dissenting, fighting and working against its power, there will continue to be hope.